1906 Stonegate Drive , Denton TX 76205-8260. Memorial Services will be held at Denton Bible Church on Wednesday, July 5th at 11:00 AM, with a reception to follow at the church. Location of Denton Bible Church: 2300 E. University Dr. , Denton, TX 76209. William Edgar Harber died at the age of 78, born October 22, 1938 in Beaumont, TX to William V. Harber and Evelyn Phillips Harber, due to an airplane crash in his beloved RV-7 in Arizona on June 27, 2017. The Memorial Service will be held at Denton Bible Church on Wednesday, July 5 at 11 o’clock with a reception to follow at the church. The deceased will be best remembered for his activities and contributions in the U.S. Army (February 1962 - February 1966), Corporate Pilot for Celanese Corporate (1964 - 1966), Pilot for Delta Airlines (1966 - 1997). Married to Janette Beauchamp Harber (1965 - 2007 when she went to be with the Lord Jesus). Bill had a love and passion for airplanes. 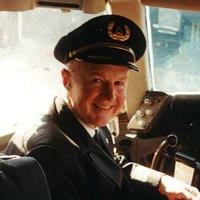 He flew airplanes since the age of 14 and said on many occasions, “all I’ve ever wanted to do my whole life is fly airplanes.” He served as a pilot for many companies including over 30 years with Delta Airlines where he retired as a captain. You could always find him at the Denton Municipal Airport working on his airplanes and talking with his friends and fellow pilots. He loved the Lord Jesus and was an active member at Denton Bible Church for over two decades, greeting people with a smile as an usher, faithfully studying the Bible in Sunday School, and constantly ministering to people in his day-to-day life, always eager to share the Gospel. He attended Bible Study Fellowship every year. He gave generously to many ministries and missionaries around the world. He was a family man who would do anything and everything for the ones he loved. Bill is survived by his son James and his grandson Tristan, his grandson Ian and his wife Katie, his sister-in-law Renee Beauchamp Skeels and her daughters Sadie and Katherine Skeels. Janette Beauchamp Harber, 62, of Denton passed away Wednesday, December 26, 2007. She was born April 14, 1945 in Corpus Christi to Charles P. Beauchamp and Mary Jo Rich Beauchamp. She married Bill Harber on August 24, 1965 in Corpus Christi. Texas. She was a member of Denton Bible Church. Services will be Saturday December 29, 2007, at 11 a.m. in the Chapel at Denton Bible Church with Rev. Jim Hill officiating with burial to follow at Roselawn Memorial Park. Visitation will be Friday evening from 5 - 7 p.m. at DeBerry Funeral Directors. She is survived by her husband, Bill Harber of Denton; mother, Mary Jo Beauchamp of Peachtree City, GA; son, James Harber of Lewisville; grandsons, Ian Harber of Denton and Tristan Harber of Lewisville; sister, Renee Skeels and husband, Dennick, and nieces, Sadie and Katherine Skeels, all of Peachtree City, GA.
Are you going through any kind of spiritual attack or affliction or you want to get your ex husband or wife back? Dr. GURILARICO GURU THE GREAT is a traditional herbal and spiritual doctor that can help you out for free. Contact him to help you solve your problem for you free of charge. He is based in US. And here is his contact details Call : Eight Three Two Two Six Three Seven One Two Eight.